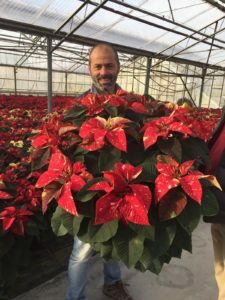 The poinsettia growers selected the area of Latina, 80km south of Rome, for this year’s study tour (12th – 14th November 2018). This rural area is a centre for all kinds of horticultural production and its edible and ornamental produce are distribute all over the country and exported to northern Europe. The province of Lazio is in the coastal region around Rome with a population of 5.9M 9of which the city of Rome is about half). 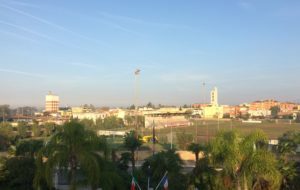 Within this province is Latina with half a million inhabitants and around the city of Latina is the heart of Italian horticulture in many forms: vegetables, flowers, fruit, cheese, sugar and ornamental plants, of course! The Latina area is in some ways reminiscent of Spalding, in that it was a marsh area drained in modern times to make it available for agriculture. 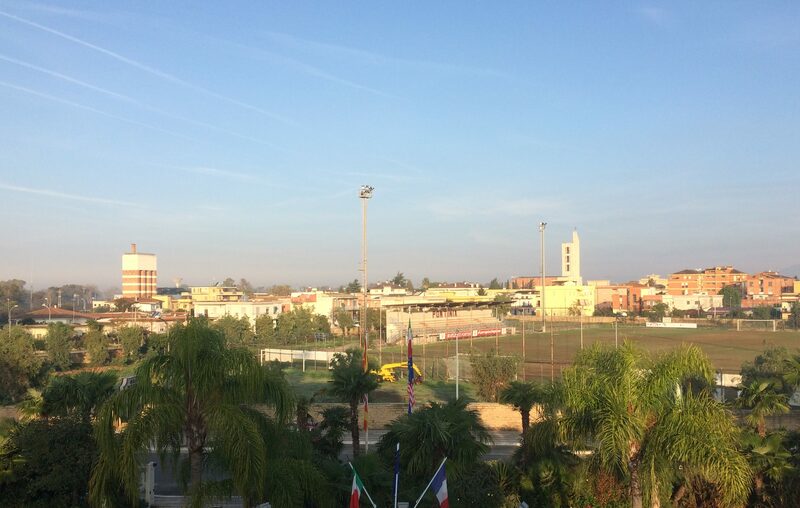 Under plans developed by the government in the 1920’s led by Mussolini the land was improved and large scale production opened up to provide jobs and business for a relatively unpopulated area. Over 2000 km of ditches and drains have been built and you can see some of this on newsreel of the time https://www.britishpathe.com/video/il-duces-crowning-achievement which shows Il Duce at the inauguration of the city of Littoria (now Latina) in 1932. Due to the coastal location, the climate avoids extremes of summer temperature with an August average maximum of 31°C and winter minimum around 3°C and relatively high rainfall of 83cm coming mostly in the winter. Even in the winter light levels are naturally high and no assimilation lighting is used, even on young plant production. Poinsettias being finished at this time without heat but they will have to protect the later maturing crops. The daylength is very similar to our own at present and the commencement of initiation also similar making the stage of maturity look very familiar to UK growers. Much of the current horticultural production is under polythene structures with some glass and a large area of outdoor production for ‘mediterranean plants’. 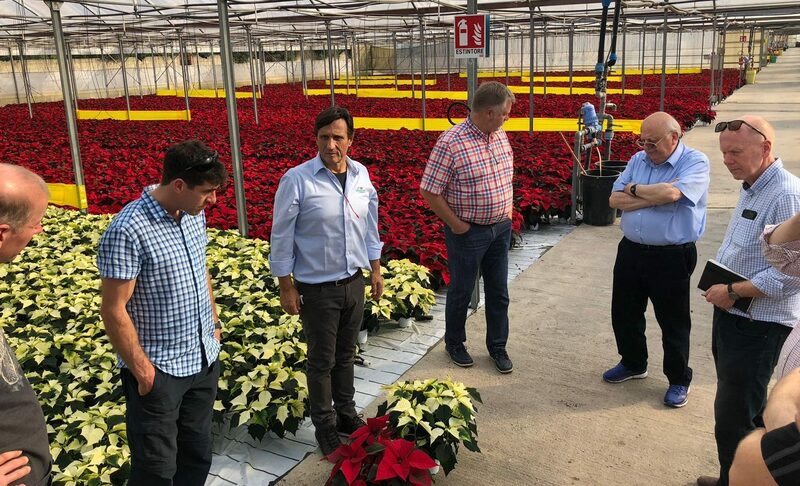 The large companies that we visited, some of the 90+ producers in the area, extended to many hectares of covered and uncovered nurseries with a wide range of pot crops focusing on annual plants in the early part of the year followed by large cyclamen and even larger poinsettias. 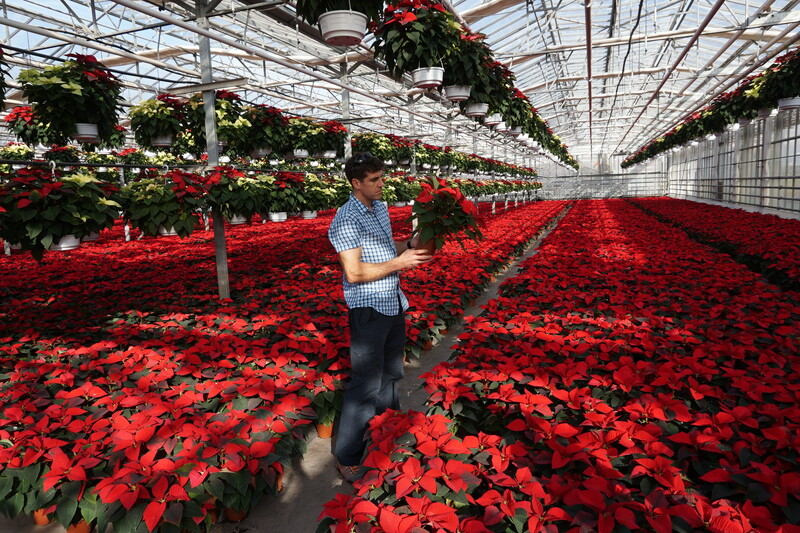 About 17M poinsettias are grown in Italy and a large percentage (3M+ ) in the Latina area. 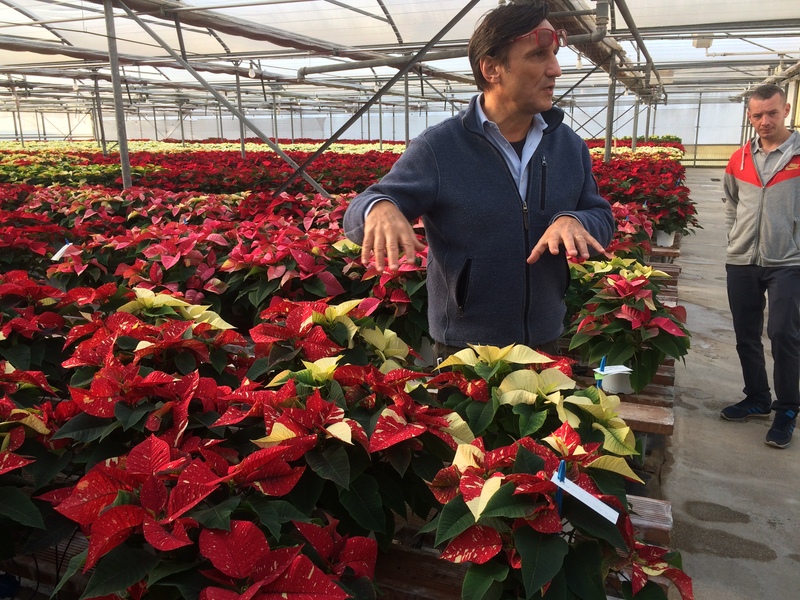 Many of these plants are large size and so the total turnover in the poinsettia production industry could be as much as €110M! There is some discussion about the European league status of Italy in terms of numbers of plants grown but in relation to the turnover of the trade, they must be second after Germany. The first visit was to Remo di Meo in Nettuno, which has 15ha of high glass and around 40ha of total production including outdoor shrub/ herbs (aromatics). The company was founded in 1998 and built to its current size in 20 years. They produce about 8M pots per annum which are sold via supermarkets and garden centres. The grow 300k+ poinsettia in 14,16, 18, and 22cm pots with ‘Trees’ (Alberetti) in 22cm potted in week 19 using Bella Italia (good marketing?) and ‘Baskets’ (seen everywhere in the roof space) 3 plants in 25cm pots. Trees up to a metre in height, are grown without any hormone treatments and were selling for around €12 wholesale. 22cm pinched plants, wholesale for €8. Large plants in garden centre will commonly retail for up to €25 and in supermarkets for €15. Poinsettia: (Italian- Stelle di Natale) are known everywhere simply as ‘Stelle’ (Stars). Growth regulation, as with other chemical applications, does not seem to be an issue and they are using Alar and Cycocel in combination. All the plants that we saw, and many of them in large pots, were very tall by UK standards and even the 14cm plants are aiming at 45cm including the pot, with some plants much bigger than that. 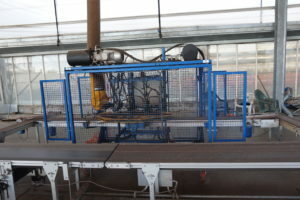 They are treating plants once a week in the growing season and less after the initiation period.Due to the domestic requirements for plant displays there is a good market of very large plants which would not be possible in UK homes- there would be very little opportunity to use such large plants in a modern built dwelling. 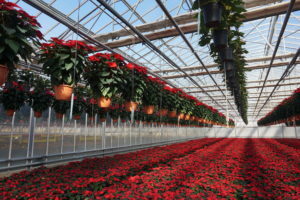 As with poinsettia production anywhere, the topic of whitefly could not be overlooked. They (in common with several other growers) could not see how that can use biological methods of control. It is a management issue and they do not have the capacity to ‘control’ the systems. They are also faced with a large insect pressure due to the outdoor production of vegetables all around them. As a result they rely on a range of chemicals and seem to have relatively good control of the pest situation. In looking at new varieties in their trials, they are assessing sensitivity to insect pests and felt that ‘Serena‘ may give less problems in this regard. There are no possibilities to breed this factor into new varieties but the question was posed if GMO’s (not currently allowed) could offer some improvements in future. 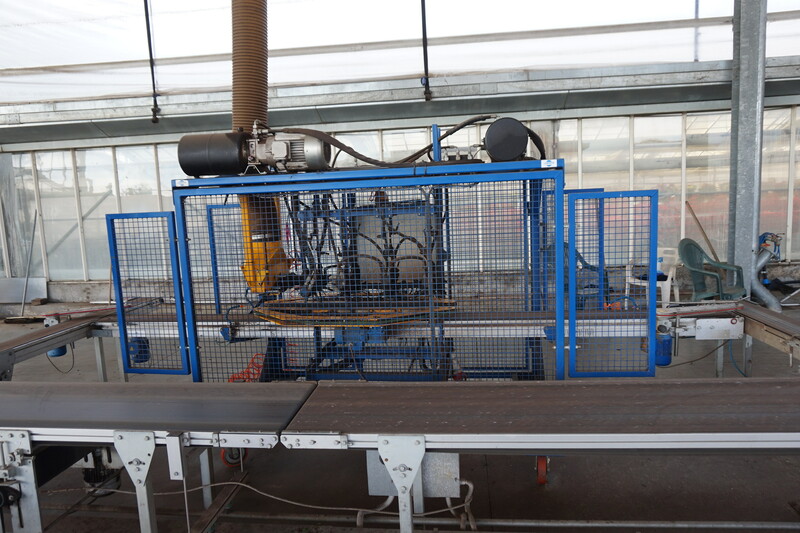 There were large areas of outdoor herbs at di Meo, which they handle using large forks and trim on mobile benching systems with a Lommers round plant trimmer. Semi mature plants seen this week were re-trimmed after some hailstorm damage necessitated further work. In the next nursery, Saracino, which has 15ha (10ha covered) was mostly plastic houses which includes 2 other locations has been 15years in development. 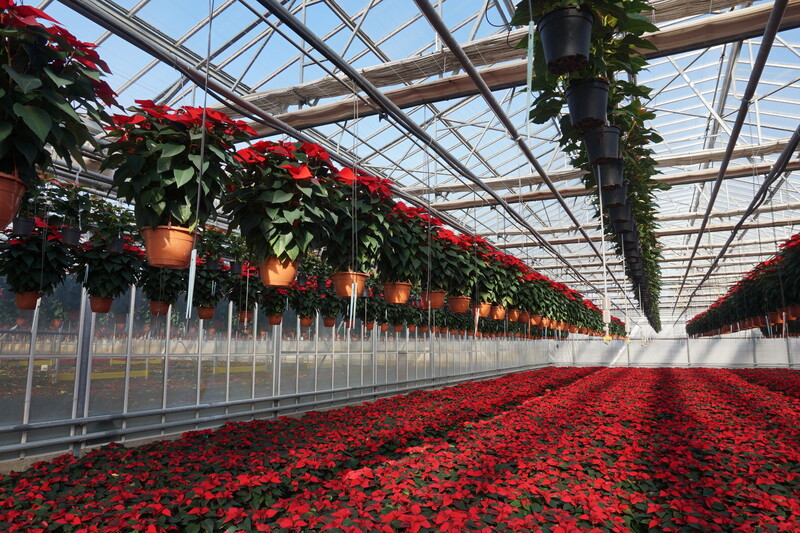 Overall they grow 4M plants with around 500k ‘Stelle’ (a large % in 14cm) with 10, 14, 19, 22cm and baskets. 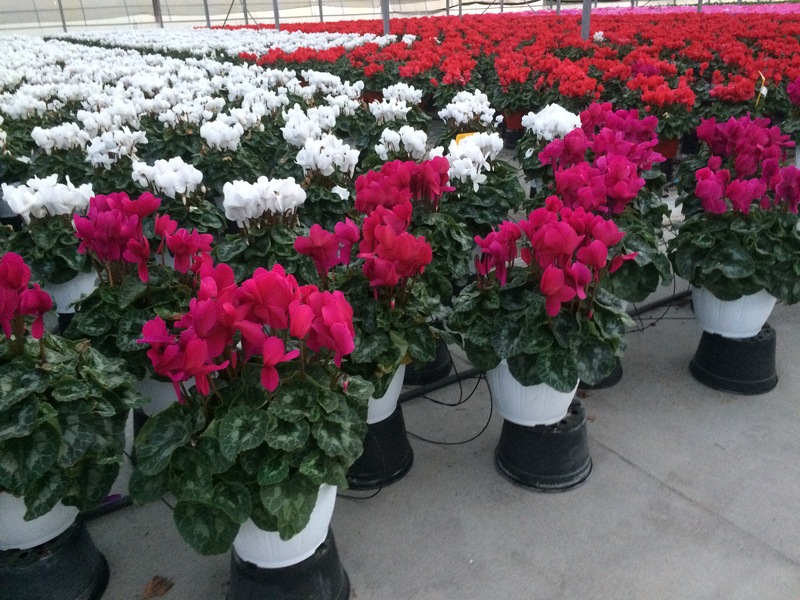 They also have a very fine quality of 700k large cyclamen. 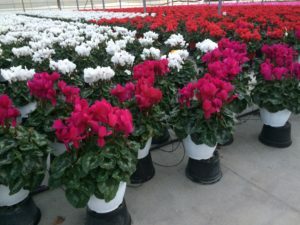 Much of the production is in clay pots which appears to be better to the plant water balance and achieves 30-40% more in sales price than plastic potted plants. They also have a very large crop of chrysanthemums for 1st November (Ognisantti). They are currently finishing a crop of 10cm ‘Solar‘, on the floor without any heat for supermarket sales where they will be getting a price nearer €1 each ex nursery. They also had a trial of ‘Grand Italia’, which they found too tall for this 10cm product. Heating in the houses we saw for later crops was using small, locally sited burners using either diesel or ‘Nozoro’- the emptied shells of hazel nuts filled in large hoppers. They had a range of varieties including over a hectare of ‘Aurora’ and the white varieties ‘Alpina‘ and ‘Alaska‘ (the former having a better white colour in the North or with a finishing temperature of 16-18°C and the latter can have a better shelf life. Most crops have been given PGR during the first part of the culture and little after pinching. Large cyclamen in clay pots at Saracino. 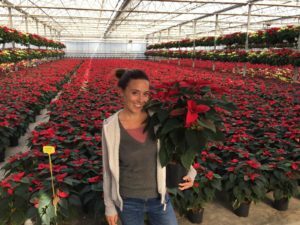 A smaller nursery, Serre Pontine (4ha) in Aprilia, showed the group some really good large specimen poinsettia bushes in a variety of colours. Altogether 270k poinsettia in 14,16,19 and 24cm. They also produce a range of plants including geraniums and annual plants, hydrangea and pot roses (19 & 21cm Poulsen and Kordes varieties). Large specimens for charity sales at Serre Pontine. No joke intended here, this does not reflect their wholesale pricing policy; they have worked for many years with a Lymphoma cancer charity to market poinsettia. 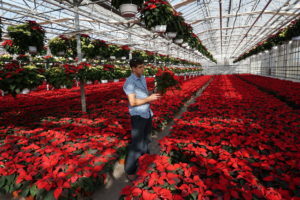 Approximately, 50% of their sales are made locally and 50% via a charity that has cooperated over 25 years to sell poinsettia on city streets with a share of the margin going directly to the charity. Large specimens are potted week 24 and normally achieve €12-15 wholesale. ‘Happy Day’ was used in 14cm and ‘Aurora‘ in 16cm potted week 28. The last visit of the day was to Mario di Castagnola who has 4ha indoors and 1ha outdoor plus a company on Genoa which aids distribution to the northern markets. 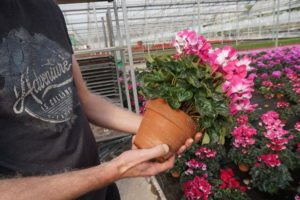 Of the 2M pots produced in hydrangea, cyclamen (300k), dipladenia and 100k poinsettia, much is marketed via garden centres and some sent to the Genoese connection. They are changing their cropping from a marketing perspective, they need to have a wider range of products to satisfy clients (primarily garden centres) that want mixed deliveries and so they are aiming at product crop sizes in the region of 40-60k. Interestingly, they have a production area with a group of plants: hydrangea, hibiscus and dipladenia which they manage using some of their own stock and here they focus on biological control. 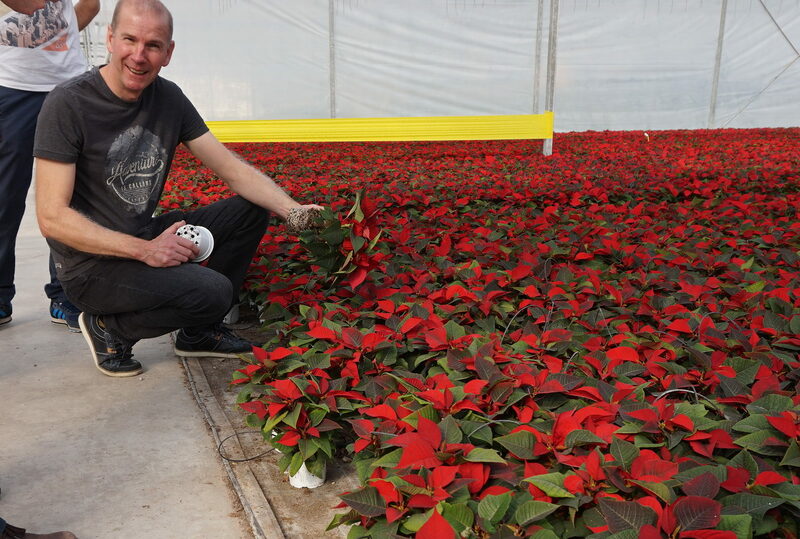 In the next house thy have 14cm poinsettia ‘Solar’ potted in week 32 and only given 1 application of PGR. 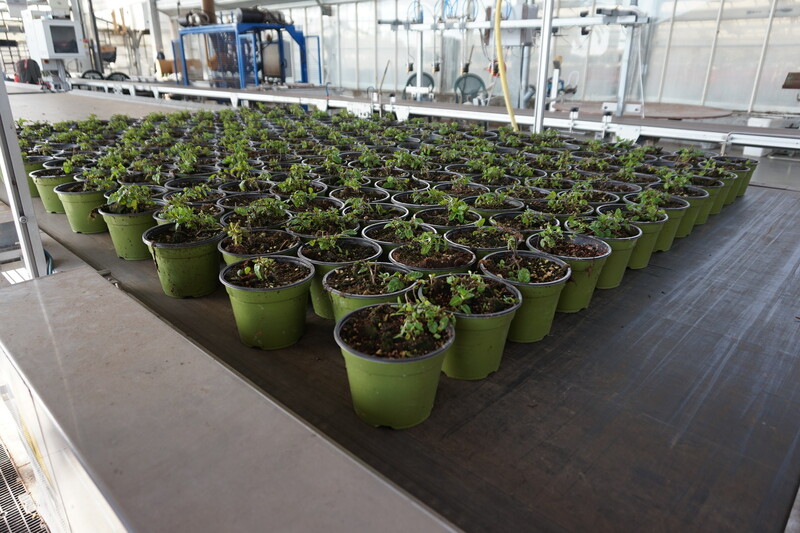 Their larger plants were potted in week 30 and will be given a slightly lower temperature finish at 14-15°C. They had some enormous ‘Halios‘ cyclamen in 24cm pots. Apparently, these plants selling now were potted in week 14 and have had flowers removed only once. Looking at selection of ‘Superba Glitter’- Lazzeri. The group was guided around the, simply named LP2, by Antonio Rodrigues who is responsible for the mother plant production in Sabaudia (Latina). The nursery started in 1971 which developed to 6.7ha. Starting with the poinsettia selections house, held in an insect-proofed, positive pressure, plastic greenhouse, the group was shown the latest selections and discussed the procedure for stock re-selection and maintenance. As noted by Harry, this was for the maintenance of stock stability and separate from the initial seedling selection. The whole process including all the stages of selection, grafting, stock buildup, and testing will take about 5-6 years. Andrea Lazzeri explained the process in detail, illustrating his talk by reference to Superba Glitter’ which is a variegated variety and needs regular re-selection. In the clone they are selecting now they aim to reduce the percentage of marble plants for 2020. Currently, they are holding a collection of approximately 150 varieties in development and being traded. Wayne asked if there were any refinements possible for the initial selections using ‘gene-marking’ techniques. Andrea noted that they are making selections based on grower knowledge of form, response, shelf life, vigour and branching. In the Dutch LTO trials they are basing assessments on growth form(40%) and shelf life (60%). Insect netting and air-lock doors- Lazzeri. All mother stock areas and stock selection houses are kept in insect proof houses which are carefully maintained. House entrances have air-lock areas and disinfection stations where workers can change clothes. Insect proofing is important in view of the local insect pressure but there is a regular spray programme and scouting operation. On the day of the visit the air temperature was 8°C outdoor and 15°C indoor. Obviously, these temperatures rise to 30°C/ 40°C in summer and work starts very early in the morning! All poinsettia mother stock is grown here in Europe although other products are imported from stock producers in Brazil and Kenya. 10cm poinsettia pots at Lazzeri. 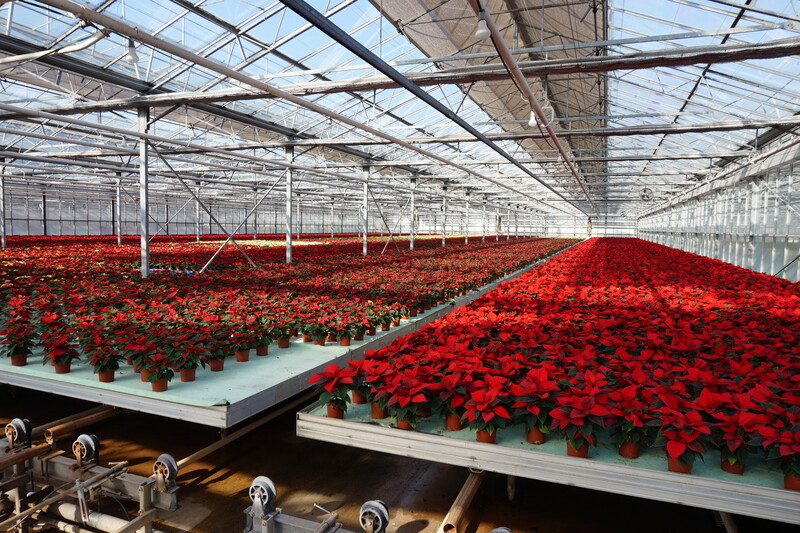 In the growing houses at LP3, around 3ha of finished poinsettia are being produced in 10Acm pots, direct stuck cuttings week 33 which are sold, some via clients who are producing the larger sizes themselves. Here they are using a range of varieties including ‘Futura Brilliant’. Some of this crop was affected by late Pythium and being treated with a drench of Subdue. They were also applying Gnatrol (Bacillus thuringiensis) against Sciarid fly in another house. They were planning to replace the film in this house which had been installed over 10 years ago. They did not plan to change their film type but normally use Redu-heat outside as many of the vegetable growers do in this area. They have had some problems cleaning the outside of the houses this year as there was no rain for several weeks. 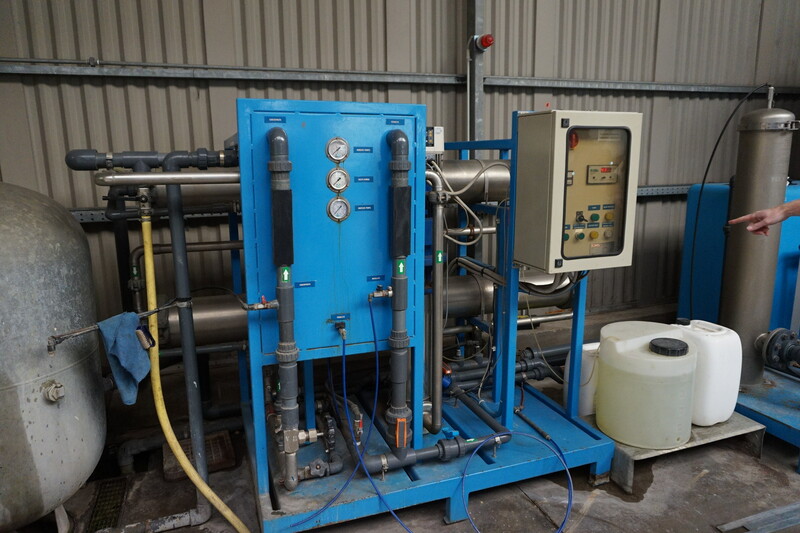 Reverse osmosis equipment at LP3 Lazzeri. 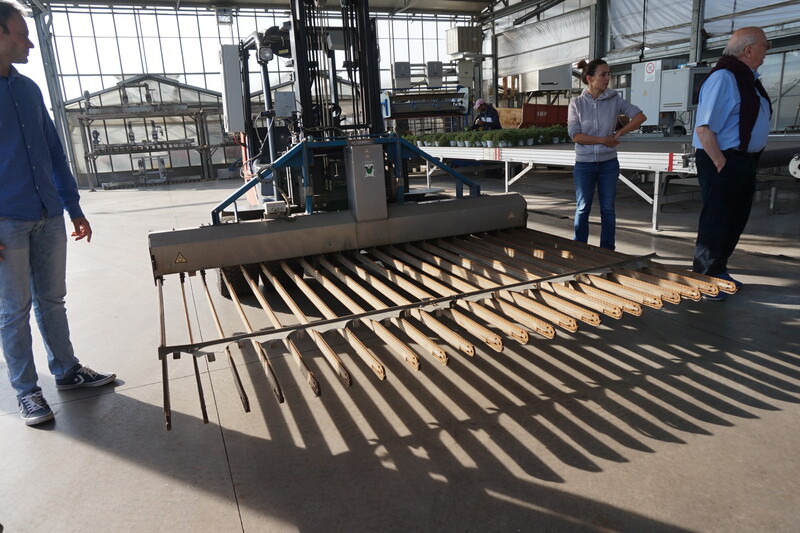 The young plant production is house at LP3, a few km away, under the management of Friedhelm Krackhardt, who was looking at the recent arrival: a Plant Paper rooting plug machine- https://www.transplantsystems.co.nz/nursery/plantpaper/plantpaper-machines/plantpaper-semi-automatic-2-in-1. The 3ha nursery here is set up for young plant production and will produce, without assimilation lights in winter, and only has a heating system for a limited number of days when the temperatures drop to 3-4°C. In addition to their fertiliser dilution system, they also had a reverse osmosis machine to clean their irrigation water. They draw water from 3 boreholes on site which are about 60-70m in depth. Andrea gave the group a very brief overview of the company which was founded in 1925 in Merano (Alto Adige) and the second Production site built in 1971 in Sabaudia, adding a second farm in 1990. (around 11ha in all). They produce around 1000 lines 160 of their own breeding. 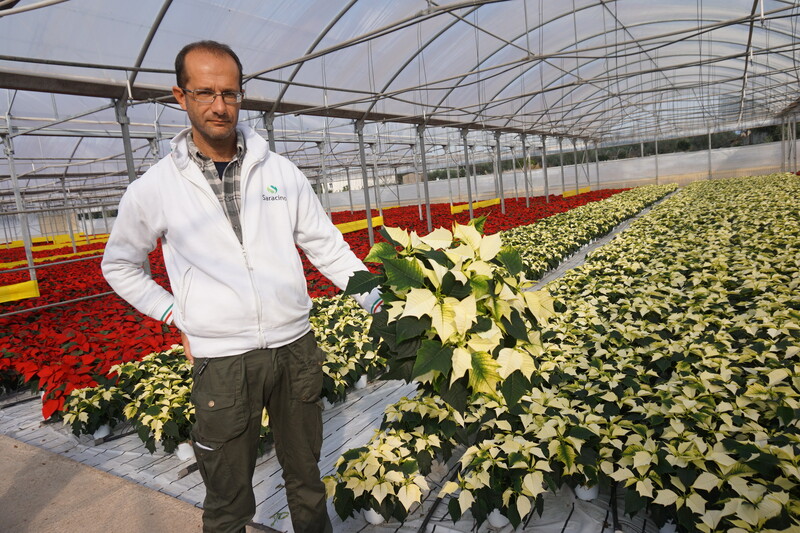 They have supplier in Brazil (LP4) and in recent times also get material from production nurseries in Naivasha, Kenya. In Merano, they house their breeding department, analysis laboratory, tissue culture lab and elite department. 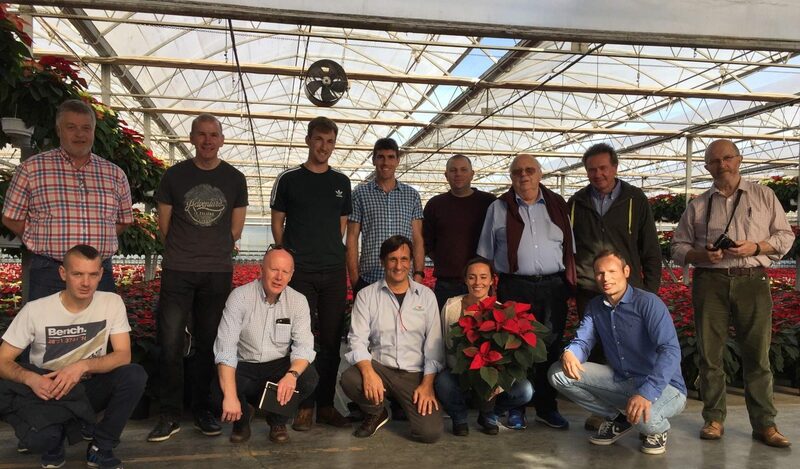 The last nursery on the tour was Vivai Pontini in Pontinia, 20ha of production on 3 sites producing the whole range of flowering ornamentals including some large size indoor foliage plants (Scindapsus, Hedera, Sanseviera, Palms etc). They have about 500K ‘Stelle’ in 10, 14, 16cm and baskets. The peat debate was not a ‘live’ one in Latina and a lot of Latvian and Pindstrup bales were seen around. Some companies were buying in proprietary mixes from local potting soil producers. PGR treatment at Vivai Pontini using drench on hangers. 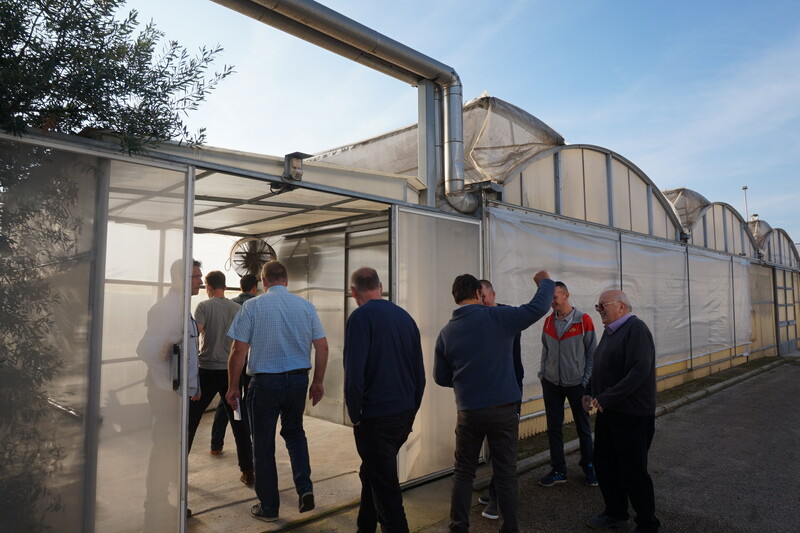 The tour was a very good opportunity to see what is happening in another area where the market is quite similar but the products, varieties and methods of production are subtly different. Hopefully, this gives all more insight into what they are doing in their own businesses. PPS There were no recorded sightings of the ‘cut-flower’ poinsettia and despite enquiry, apparently no plans to breed one!